The awards for 2013 are now closed. You can view the winners here. Please come back in the Spring for news of the 2014 awards. 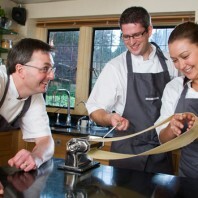 Following the success of last year’s cookery school awards – see the 2012 winners here – the original and only truly independent competition to find the very best cookery school in the country has launched for 2013. Cookery schools are one of the most vibrant and exciting sectors in British food today. Throughout the UK and Ireland there is a tremendous range of specialist classes available and new schools are opening every week. As the independent experts in the field and the only organisation that regularly reviews cookery schools, Looking to Cook is ideally placed to give recognition to those schools that are leading the way and offering something that little bit special. These two will be picked from the entrants above. HOW TO ENTER: Entry to the awards is easy and FREE if you’re signed up to Looking to Cook (you can sign up here). For non-subscribers the cost to enter the awards is £39, which can be paid by using the PayPal button below, or by bank transfer or cheque. If you’d like to enter your school or company please send us an email clearly stating which category you are entering in the subject box and a short statement highlighting why you think your school should win; each school/company can enter no more than three categories. Deadline: September 27th, 2013. JUDGES: The final stages of judging will take place in October and the winners of each of the awards will be announced later in the year and featured in a national newspaper. They will also be awarded special badges on their Looking to Cook profiles and a prize to be confirmed. The winner will win a six-month advertising slot on the Looking to Cook website, subject to terms and conditions. Nick Wyke, founder of Looking to Cook, and Celia Brooks, cookery author and tutor and founder of London’s Gastrotours. Public votes and comments for a particular school, course or tutor can be made via the comments box at the bottom of a school’s profile on the Looking to Cook website, or via our Twitter, Facebook or Pinterest pages, using the hash-tag #cookschoolawards. The quality and volume of what we consider to be authentic support for a candidate will be taken into consideration by the judges when reaching their final verdict. Above all we are looking for evidence of infectious enthusiasm and fun in an open environment where students can learn and indulge their passion for food. We are also looking for consistency and creativity in the conception and execution of classes, and a capacity to share knowledge through compelling teaching. The winners will be the sort of school or course that people would like to return to again and again. It’s simple to get involved, and there are excellent PR and marketing opportunities for participating schools. The looking to Cook Cookery School Awards are the ultimate showcase for the industry and we strongly recommend that the owners of all schools enter the competition.